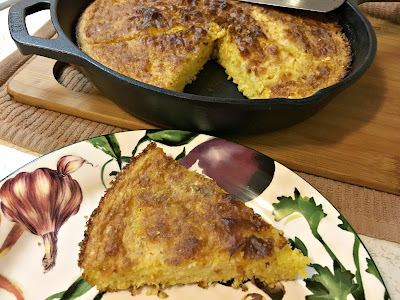 There are two main kinds of cornbread - sweet with flour added (Yankee) and non-sweet non-flour added (southern), and folks are passionate about which one embodies the true essence of the dish. Having grown up in Texas, I skew toward the non-sweet non-flour version. It should be coarse and full of corn flavor. But not dry. For the longest time my cornbread came out dry. I guess that might be why those Yankees started adding sugar and flour to it. But I wanted to see if I could find a recipe that would match the great savory flavorful cornbread one finds in diners all across the south. I found this recipe in a cooking newsgroup that has been around since the early days of the worldwide web and it is a keeper. You put whatever fat you are using into a cast iron skillet and let it heat up in the pre-heating oven. When it is smoking hot you add the batter. That is the secret to getting a nice, crispy crust. And the lack of sugar gives it a more intense corn flavor that is delicious all on its own or as an accompaniment to a big old pot of beans. I use coarse cornmeal for this recipe. I am sure it would be quite lovely with the finer grind as well. Put the fat in the skillet and place the skillet in the middle rack of the cool oven. Turn the oven on to 450° F and let the pan heat up while you mix the rest of the ingredients. Combine the cornmeal, salt and baking soda in a large bowl and mix well. Beat the egg and add it to the buttermilk. When the oven is up to temperature add the buttermilk and egg to the cornmeal, salt and baking soda and mix together quickly. 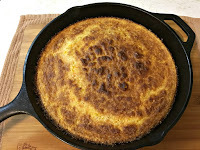 Pull the skillet out of the oven just long enough to quickly pour the batter into it and return it to the middle shelf. Bake for 20 to 25 minutes, until golden and a toothpick inserted in the center comes out clean.